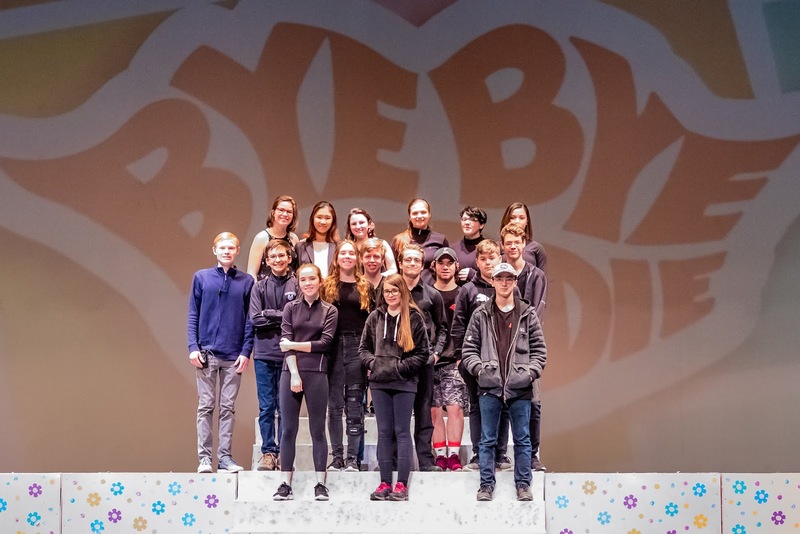 From February 22 to 24, the Wyoming High School Theatre Arts Department presented the musical Bye Bye Birdie to the Wyoming community. 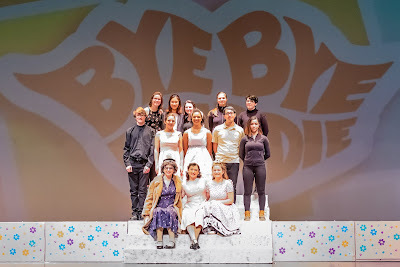 Bye Bye Birdie is a fun, relatable story based on the year 1958. Rock-n-roll singer Conrad Birdie (played by Sal Giolando), the idol of the teenage girls, gets drafted into the U.S. Army, devastating millions of fans across the nation. On the other hand, Albert Peterson (played by Sam Steed), an unsuccessful songwriter, and his girlfriend and secretary, Rosie Alvarez (played by Katy Vanatsky), plan to have Conrad perform Albert’s song “One Last Kiss” and kiss a lucky fan, Kim MacAfee (played by Annie Elliott). The musical is filled with joyful melodies and witty scenes, completed through the collaboration of all the talented students and directors. 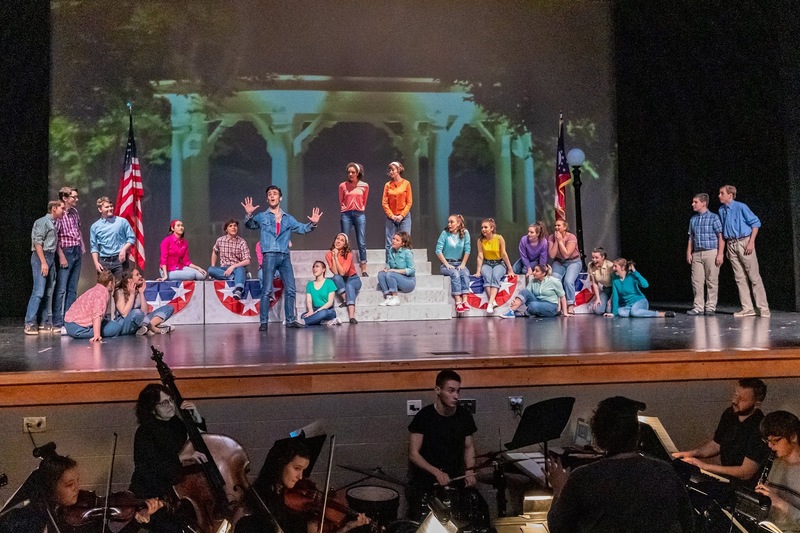 The Wyoming theatre students, directed by Mrs. Linda Baker and Mrs. Laura Coomer, spent months to present the musical in the best way possible. Thirty-six actors and actresses, twenty technical crews, and fourteen pit orchestra students achieved a beautiful harmony to impress the community yet another time. Every student displayed incredible talent whether it be singing, acting, dancing, playing a musical instrument, or managing and organizing the stage, to make the show more enjoyable for the audience. The entire company of Wyoming High School’s Bye Bye Birdie! Photo by Rod Apfelbeck. The experience for the students of pit orchestra was also one that was extremely special and inspirational. Grace Hitt, an amazing senior trumpet player, says, “I appreciated having a second trumpet and third trumpet; this musical was the first I’ve played in in which we had all three parts covered. Also, the pit orchestra’s dedication and commitment during the last few weeks of rehearsal encouraged and inspired me.” She explained that there were challenges in the beginning, but all members worked harder both during and outside of rehearsals to be fully prepared for the show. The show went on even during intermission. In the fifteen-minute intermission, the audience was also given the chance to take a peek into the photo display of costumes, designed and created by Glory Lee, a senior student who dreams to be a fashion designer. Glory worked with Mrs. Baker to design and alter costumes and props to add to the emotions of the actresses and the details of each scene. 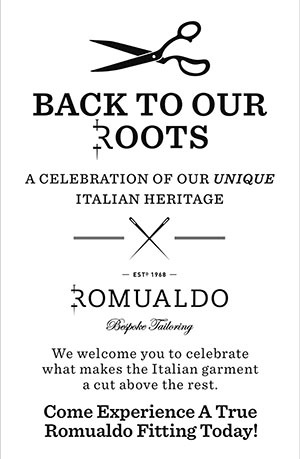 From scratch, she created six original dresses, the most that she has made for a play or a musical. 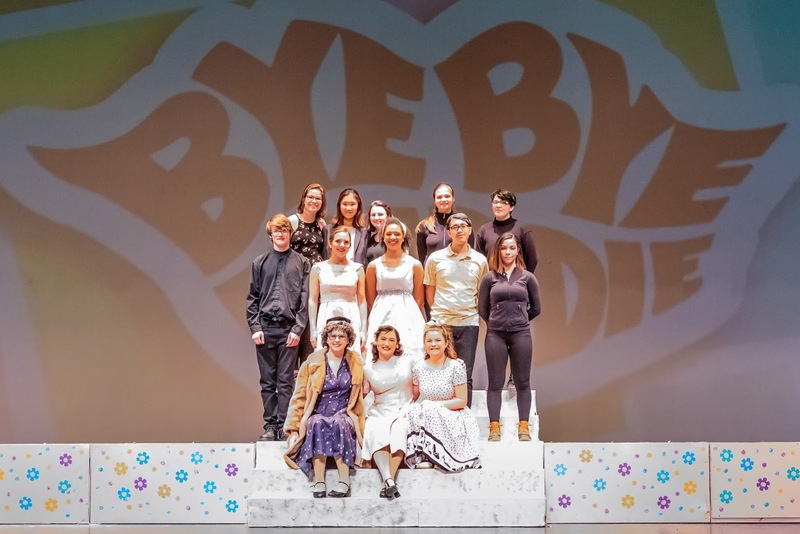 The members of the Class of 2019 from the production – many of them finishing their high school theatre/orchestra/crew career with this show. Photo by Rod Apfelbeck. The next Wyoming High School Theatre Arts production is Don’t Drink the Water, a comedy play that will be presented on April 26 and 27 at 7:30 p.m. The theatre department is already excited for this play as it will be a delightful, entertaining show to finalize the productions of the school year. Tech Crew enjoys being behind the scenes, literally, so they rarely agree to having their photo taken. Photo by Rod Apfelbeck. Senior Glory Lee designed and created six of the dresses worn in Bye Bye Birdie. Glory plans to continue her pursuit of fashion design next year at Rhode Island College of Design. Glory is pictured here with five of the dresses and actresses for whom she designed. Left to right: Suzanne, Sara, Sarah, Glory, Katy, and Annie.